Re: What is the difference between the Blood groups A1 and A2?? Before we deal with the A1/A2 blood subgroups among humans, let me first spend a few sentences summarizing exactly what this nomenclature refers to, which may clarify the situation. The ABO blood group system refers to variants of a molecule that is found on red blood cells (and some other cells), called H antigen. This molecule is a glycosphingolipid (basically a "head" of linked 6-carbon sugars attached to a lipid "tail", which anchors the whole thing in the plasma membrane), and different people have different variants of it genetically encoded in their DNA. People with the "O" subtype have the usual 4 sugar arrangement (galactose/N- acetyl glucosamine/galactose/fucose), whereas the "A" subtype features an extra N- acetyl galactosamine ring conjugated to the third galactose, which is same for the "B" subtype except that the extra sugar is instead another galactose. That's the main gist of the 3 subtypes, but how is H antigen actually made? Most complex molecules are synthesized in the body by special enzymes (catalytic proteins), and this case is no exception. The enzyme that catalyzes H antigen is a glycosyltransferase coded by the ABO gene, whic functions to add specific monosaccharides (single sugars) to other glycoconjugates (molecules with a sugar chain already present). And now comes the key connection of all this biochemistry to human genetic variation: the different sugar arrangements of the O, A, and B are created by genetic variants of a single gene (the ABO gene) among various populations. The A and B genes are co-dominant, hence individuals can be phenotyped as A, B, AB or O. And now we come to the question: a common dimorphism in some populations leads to the division of blood group A into A1 and A2, the latter basically showing weaker antigenicity. On occasion, A2 activity is weakened further when competition due to a co-dominant B gene occurs (which gives the A2B phenotype). Weak alleles like A2 can be thought of as being an intermediate phenotype between the full strength "A"(A1) and the completely inactive "O". Delving into the DNA, we can briefly review the mutations that lead to the different sugar- conjugating behavior of this enzyme. The ABO gene consists of seven exons which when spliced together make a 1062 base pair (bp) sequence coding for this crucial glycosyltransferase, of which the A1 allele is usually described as the consensus (or "main") allele. The enzyme that is the product of this gene, as we have discussed, will add N-acetyl galactosamine to a specific acceptor glycoconjugate. Now, the coding region of the A2 allele differs from A1 in two ways: first by a single nucleotide (467C>T) substitution that creates a single amino acid change (proline # 156 is changed to a leucine); and second by a 1061delC mutation which causes a frame-shift, extending the reading frame by 64 nucleotides (Yamamoto et al. 1992). These two mutations together create an enzyme whose activity is significantly weakened, but not completely abrogated. Many other less common mutations have also been described that similarly weaken the enzyme and result in weak A or B subgroups, so there must have been evolutionary pressure on this gene to develop such variants, possibly as a result of viral outbreaks among different human populations living in various ecosystems. Finally, we can note that mutations which completely inactivate the ABO gene product result in the blood group O phenotype, the most common of which is a deletion at nucleotide (nt.) 261 (261delG) in exon 6 that results in a frame-shift and premature termination of translation, leading to a truncated, inactive enzyme. How does the A2 allele affect transfusion? Well, blood from individuals expressing the A1 allele should not be transfused into non-A recipients (B or O) because they will mount an immune reaction to the "foreign" glycosphingolipid that is the product of the A1 enzyme. 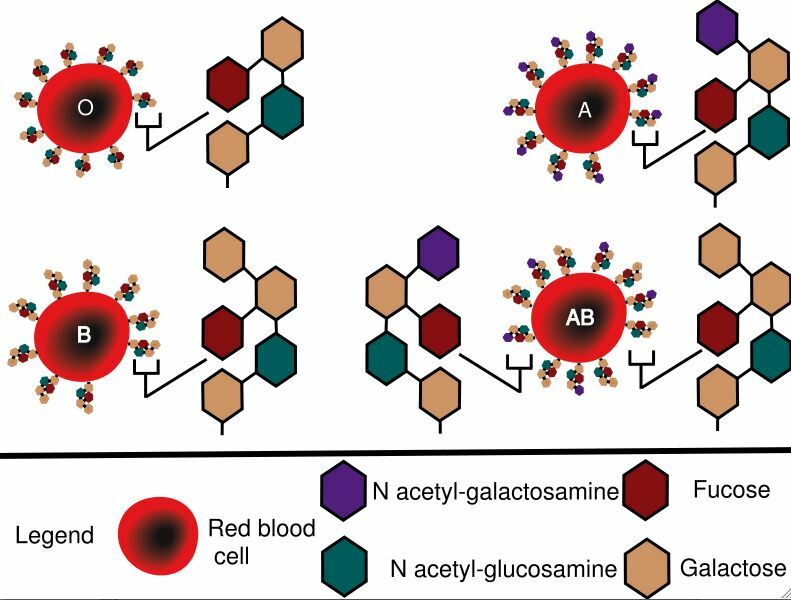 The decreased activity of the enzyme coded by the A2 allele results in much fewer H-antigen complexes bearing the key N-acetyl galactosamine on red blood cells. However, blood from an A2 donor may still cause an incompatible transfusion reaction if transferred into B or O recipients, so this should be avoided. When organs are transplanted between individuals, similar ABO compatibility/immune rejection considerations also apply, but there have been some documented cases of organs from A2 individuals being able to be transplanted into group O or B patients, without the need for debilitating immune suppression (Sorensen et al., 2001). Let me conclude with a brief paragraph on the substance DBA (Dolichos biflorus agglutinin) that enables routine A1/A2 typing in the clinic, without having to run a PCR on the ABO gene. Commonly, DBA reactivity denotes the A1 type, and non-reactivity the A2 type. DBA is a glycoprotein isolated from the "horse gram", a leguminous pulse crop of the subtropics. This hardy plant has likely evolved to use such "custom" sugar-trapping molecules (also called "lectins") as a form of chemical defense against pests and pathogens. For our purposes, the DBA lectin is useful due to having exquisite specificity toward alpha-linked N- acetyl galactosamine, which as you will recall is the key sugar that delineates the "A" subtype. This specificity has rendered DBA to be approximately 5000 times more active in agglutinating blood group A1 cells versus A2 cells, leading to its widespread use in clinical assays. Apart from being used to distinguish A1/A2 blood types in routine serology, DBA has also been used to establish secretor status in A1 individuals by hemagglutination inhibition techniques and has potential applications in examining tumors that affect the levels of blood group substances. Yamamoto F, McNeill PD, Hakomori S: Human histo-blood group A2 transferase coded by A2 allele, one of the A subtypes, is characterized by a single base deletion in the coding sequence, which results in an additional domain at the carboxyl terminal. Biochem Biophys Res Commun 1992, 187:366-374. Sorensen JB, Grant WJ, Belnap LP, Stinson J, Fuller TC. Transplantation of ABO group A2 kidneys from living donors into group O and B recipients. Am J Transplant. 2001 Sep;1(3):296-9.